I loved working with this fabric. Stout fabrics are my new favorite at the moment! 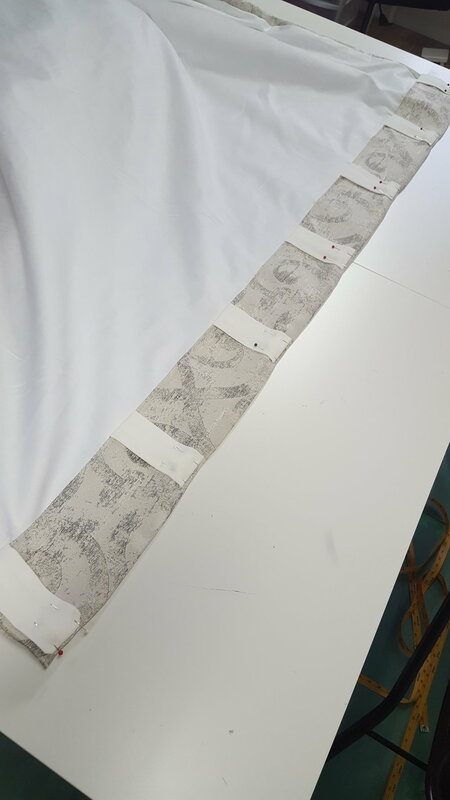 To make any standard drapery panel start with the overall finished length you'd like your drape, And add 16". These were 89" finished so I cut two lengths of 105". I cut the lining at finished length (which is 2" shorter than the decor fabric) plus 10". The lining needed to be 87" so I cut two lengths of 97". Hem. Unlike apparel, in drapery you hem FIRST! Take your decor fabric. Fold up the bottom 8" Iron, then fold that in half, and iron again, you'll have a 4" double hem. Then blind hem both panels. Next fold up your lining 2" and fold that in half. You're left with 1" hem. I just straight stitch that, but you could do another blind hem if you want to be all fancy. Note: the width of your lining should be at least 3" less wide than the width of your decor fabric. My decor fabric for this project was 56" the lining was 53" This pulled about 1.5" on each side to the back. Stitch them together. Now Line up the tops of 1 panel and 1 lining, right sides together. Your lining should be 2" shorter than your decor fabric. Stitch the sides together and turn the panels right side out. Header. Now to work on the header you need a stiffener, buckrum, pleaters tape, for this one I used a heavy duty Pellon fusible facing, cut to 4" by 50". First iron down from the top 8". Then just like we did for the hem. Open it up and fold it 1/2 way down, you'll be left with two 4" portions at the top. Now iron in your fusible facing or secure down your buckram and sandwich it in between the 4" headers you ironed. Now you're going to pin your tabs into place. *to make tabs cut rectangles 4" by 6," fold lengthwise, stitch length, turn right side out). Space your tabs out evenly. Stitch through all the layers, upholstery needle strongly recommended. Next fold, pin, and stitch the top of each tab, be sure to lock in your stitches. Can you believe you're almost done? Now just press down the side seams. Your lining width is at least 3" less than your decor fabric so distribute the decor fabric evenly on the backside. At the very bottom use a tack stitch to keep the very bottom of the overlapped hem in place. And you're done! Now thread your drapery on to your rods and enjoy!